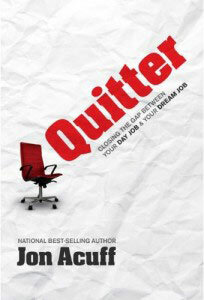 Last week I read Quitter by Jon Acuff, a member of the Entreleadership team. A lot of great thoughts in the book that I’m sure I’ll write more about later. Jon definitely doesn’t encourage people to just go quit their day job, in fact quite the opposite. But, he did share a tip that I’m applying right at this very moment. He would go to work (the day job he didn’t like) early each day and find a conference room to hide in before all the madness started. In that space he would write a blog post for his personal blog and take care of a few personal items as well. This was an AWESOME tip! It freed him up to get something personal accomplished at the beginning of the day and when he went back to his desk he was ready to completely focus on the work he was getting paid to do! So, here goes my first morning putting this concept into practice. I got here at 7:30 a.m. and actually put in an hour of work and am now taking 30 minutes to knock out a few personal items besides creating this post. I feel great! Let the bombardment begin! What would you suggest about your post that you just made a few days ago?